Serve these great-tasting baked pork chops with mashed or baked potatoes and your favorite side dish vegetables. 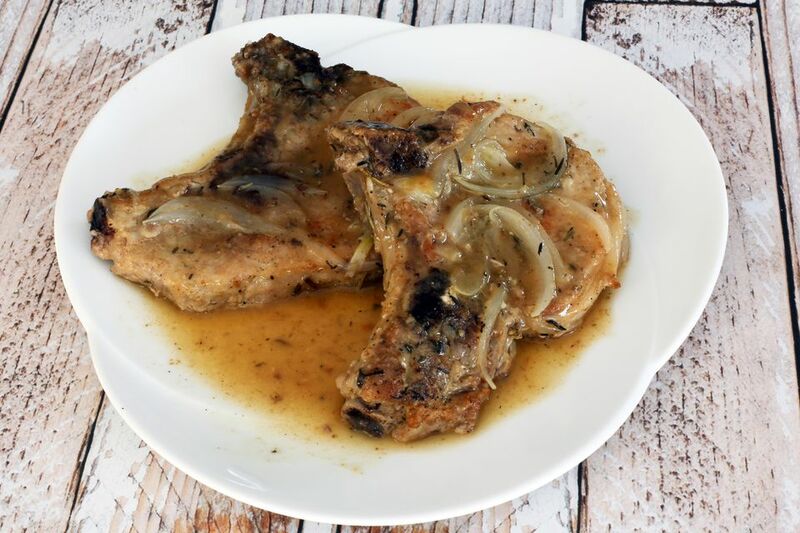 This pork chop bake is easy to put together and bake, and the sauce is simply amazing. The flavorful sauce is a combination of dry white wine and chicken stock. Heat the olive oil in a large skillet or sauté pan over medium heat. Sprinkle the pork chops lightly with salt and pepper. Brown the chops on both sides, about 8 to 10 minutes total. If the skillet is not oven safe, arrange the pork chops in a baking dish that is large enough to hold the chops in one layer. Cover with sliced onion. In a bowl combine the thyme and rosemary with wine and chicken broth; pour over pork chops. Cover the pan with a lid or cover the baking dish tightly with foil, and bake in the preheated oven for about 30 to 45 minutes, or until tender and fully cooked. The minimum safe temperature for pork is 145 F.
Remove the pork and onions to a serving platter, and keep warm. Use a gravy separator to remove the excess fat from the liquids. Strain the liquids into a saucepan or back into the skillet, and place the pan over medium-high heat. Bring the juices to a boil, and boil for 1 minute to reduce slightly and concentrate the flavors. In a small cup or bowl, whisk the cornstarch with the 1 tablespoon of water until smooth. Stir in the juices, and continue cooking until thickened. Whisk in 1 teaspoon of butter, and stir until melted. Spoon the sauce over the pork chops and onions. To increase the sauce, use 1 cup of wine, 3/4 cup of chicken broth, and 1 1/2 teaspoons of cornstarch for thickening.